No clear home base. When you click the Ping icon in iTunes’ Source list, where should you first go? Recent Activity? My Profile? People? Featured? It’s unclear. Difficult to audition others. If I want to find out if users are worth following I first have to find them (know their names or find them because they follow me) and then decide whether they have anything to offer me. The only way to tell is to click through to their pages and glance at the 10 albums/tracks each likes. That’s more work than I’m willing to go through. Cluttered pages with too little information. Regardless of which Ping area you visit, the page you view is cluttered with a lot of stuff you don’t care about. 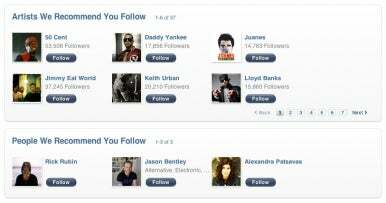 For example, when I click Recent Activity I see Apple’s Artists We Recommend You Follow, which I have no interest in as none of these artists have any relationship to the music I like. The Recent Activity area below is packed with names of people my followers are following. In most cases, this matters very little to me as well. And the thumbnail-heavy design means that information that I’d find useful is too often hidden behind a link. No iMix support. iTunes includes the iMix feature, which lets you create a playlist and share that playlist with the world. Yet there’s no option for sharing that playlist with your Ping followers. I can think of few better ways to learn about someone’s musical tastes than to look at a list of his or her 25 favorite tracks. No unconnected comments. I occasionally like to talk generally about musical subjects, yet Ping requires that any comments I post be linked to a song or album. I think I understand why Apple does this—it’s far too easy to jump off topic if you can post any old comment, and open comments would require some stern moderation because some people just can’t keep it civil. Still, a Report button that alerts moderators to inappropriate comments and a one-strike-and-you’re-out policy should keep things relatively clean. No comment alerts. I have no way of knowing if someone’s posted a comment on my Ping page unless I launch iTunes and go to that page. Even then, it’s possibly buried in a place that can be revealed only when I click a Show Details link. Because this album isn't at the iTunes Store I can't tell you how awesome it is. Tethered to iTunes. 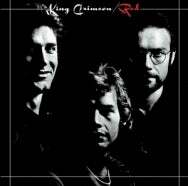 Much as I’d like to recommend King Crimson’s Red , I can’t, because King Crimson’s work isn’t available on the iTunes Store. I understand that the main mission of Ping is to encourage you to purchase more music from the Store, but limiting recommendations to the iTunes Store undercuts some of the idea behind a social network. I don’t want Apple to limit the ways in which I can be musically social. Provide page filters. I’d first implement a way to filter the information you see on your pages. For example, if I don’t find the X Started Following Y entries helpful, let me turn them off. This begins to unclutter the page. Then let me customize my page view. For example, I could view all comments made and received on the top of the page and then view the recommendations of the people I follow below. Provide comment alerts. While I wouldn’t care to be notified of every change to my Ping page, I would like the option to be notified of specific comments or changes wrought by users of my choosing. A small blue message indicator next to the Ping entry in iTunes’ navigation bar would serve nicely (heck, put one in iTunes’ Dock icon while you’re at it). E-mail could be an option as well. Incorporate Genius. Thanks to the Genius feature, Apple knows a lot about the music in my library. It could know even more by tracking those albums and tracks I play a lot. Using this information—with my permission—it could make reasonable artist and people recommendations rather than throwing a bunch of artists at me that I care nothing about. It could even give me a compatibility rating for people I’m thinking of following by comparing our genius results. Provide me with artists I might be interested in rather than those who are simply popular. Implement the “Nuh Uh” filter. If you’ve spent any time first-dating you know that you often ask your partner about the music, movies, and books he or she likes in order to gauge your compatibility. You’re also aware that there are certain lines you will not cross—if Battlefield Earth comes up as a favorite film, chances are there will be no second date. I’d provide just such “Nuh Uh” filters in Ping. Enter a handful of artists you loathe. When you’re invited to follow someone and they love one of your loathed artists, up pops an “Are you sure?” warning. Provide groups and rooms. At each Macworld Expo I play with the Macworld All-Star Band—a group of musical Mac geeks. During our one rehearsal we often talk about bands, albums, and songs we like. It would be great if I could create a Ping group for the band members and have a little private corner where we can hang out and talk music. Open it up. Real socializing is a lot more fun when an authority figure hasn’t first set down a lot of rules about how you can and can’t socialize. In its current implementation, Ping doesn’t feel particularly sociable. To make it more so try the following: Open up comments. Make it easier to engage in conversations (and provide a way to make those conversations private). Offer a way to talk about and recommend music not found on the iTunes Store. Connect with other social networking services—Twitter and Facebook—so you can more easily find people to follow. Connect with people in your address book. Provide “What I’m listening to” feeds for those who like that kind of thing. Create lists: “The first record I bought,” “My first concert,” and “Concerts I’ve seen,” for example, to get people talking. Again, it’s very early days for Ping and I’m sure Apple’s working hard to improve the service. My sincere hope is that, over time, Ping will truly become a way to socialize about music rather than be just another way to sell iTunes music. But that’s just me. What would you do to improve Ping?